How to get application button to windows top left position? Last edited by Aris on August 18th, 2018, 2:50 am, edited 31 times in total. Nice!!!! Was gonna be snarky & ask what, no tabs not on bottom option, but................. no I won't! A couple of feature/option suggestions. First, switch the bar on the left of the Add-on Mgr. to dark like in Firefox. Second, re-add the add-on version to the display. Thanks. Not sure what future versions will or will not offer yet. I was just sharing what already was ready. You have an option to return to add-on managers original ui on CMBs option page (--> "Alternative appearance for add-on manager). 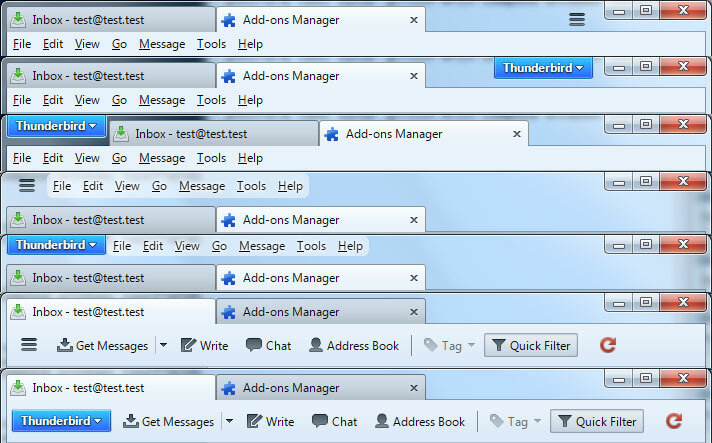 "Add-ons Manager - Version Number" can restore the version number on Firefox, Thunderbird and Seamonkey. I don't want it to make it obsolete on Thunderbird, since it was also made by me. Oops! I hadn't released that I had changed it to the light background from dark. Added "Version Number" so that is now covered. You did not change that option, it was active by default. Aris wrote: You did not change that option, it was active by default. But, I was the one who installed CMB, so it was my actions that caused it. Santa_Fe wrote: Nice!!!! Was gonna be snarky & ask what, no tabs not on bottom option, but................. no I won't! 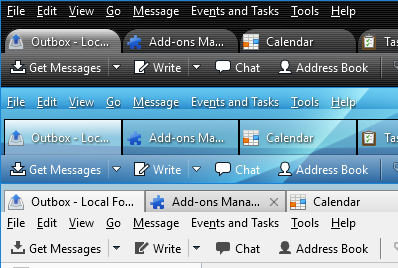 The current option to move menubar above tabs toolbar for WindVista/7(AeroGlass) and Windows 8/10 will be changed to "switch positions of menubar and tabs toolbar" and also affect Windows XP, Window Vista/7 (non-AeroGlass) and Linux. In that case it will move the menubar below tabs toolbar. FYI: While in the Add-on Mgr., when I manually updated CMB to 1.0.1, the title changed from "CustomizeMyBird" to "null". I can't recall seeing other restartless add-ons have that happen when updating. 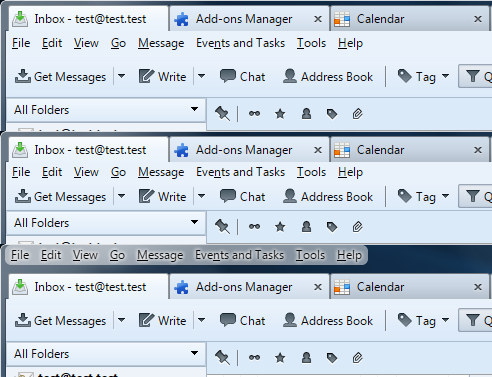 Closing and then reopening the Add-on Mgr., "CustomizeMyBird" was there, again. By activating CustomizeMyBird the Email Editor gets unusable because of white Text on white Background for the text windows (from, to, bcc and so on). The only setting that is making sense is the tabs settings. I am using Kubuntu 16.04 LTS and Thunderbird 45.4.0. Are you using a non-default OS theme? --> Move main menu button to menubars first position (if menubar is on top) or to tabs toolbar (if tabs toolbar is on top, select 'tabs and tab toolbar buttons: switch positions' option) to make the button look like CTRs Firefox application button in titlebar. Note: CMB does not create a new button, it only customizes the default menubutton. Last edited by Aris on November 8th, 2016, 4:17 am, edited 1 time in total. Just installed 1.0.2. I also have Add-on Update Checker installed. The tooltip on it's tollbar button said there was an update for "null". When 1.0.2 installed, the title appeared as expected during and after the install.